With My Disney Experience taking over the phones of guests at the Walt Disney World resort, it’s obvious that there just aren’t enough electrical outlets for all the charging that needs to be done. To say nothing of people using their phones for photos, texting and Facebook posting! 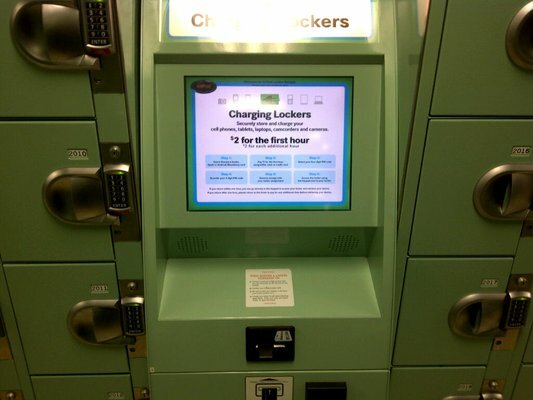 Well, Disney is working on some changes for that with complimentary phone charging lockers that began testing in the Magic Kingdom today, April 25, 2014. Since the advent of Disney’s MyMagic+, there have been a number of charging stations installed in the Magic Kingdom. They can be found in the Tomorrowland Arcade and the FASTPASS distribution area for two Storybook Circus attractions (Dumbo and The Barnstormer Starring the Great Goofini). 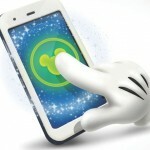 In addition, you can continue to charge your mobile devices in Fantasyland. Charging outlets are located in the ‘stumps’ at either end of the bench seating areas near Rapunzel’s Village. Both the Storybook Circus and Rapunzel village areas have USB ports as well as standard AC outlets. But, these require you to remain in place with your phone as there is no method of leaving the them unattended. The new secure lockers will be located inside Cosmic Ray’s Starlight Cafe (near the Fantasyland entrance) and the Tomorrowland Light and Power Company (Space Mountain shop, near the D-Tech area). This free service is part of a test that will continue through mid-summer. First, you must swipe a credit card to begin. The credit card will not be charged! The credit card simply acts as an ID key to unlock the charging chamber. Next, you follow prompts on a touch screen to choose your mobile phone type. This service will accommodate a variety of devices, including Android, iPhone and Blackberry. Finally connect your mobile phone to a charging outlet inside the locker. Upon closing the door, the chamber will lock. When the battery is nearing a full charge, the chamber light will turn green. To open the chamber, swipe the same credit card you originally used to open the locker. The charging chambers cannot accommodate electronic devices larger than a phone (such as a tablet). Charging lockers were installed at Disneyland in 2012. Those lockers cost $2 per hour and $2 for each additional hour. You will find them located at Main Street Lockers. Cords are included in these lockers. There are even some lockers with a standard electrical plug for cameras and tablets. But, you’ll need your own cord to use these. I’m sure many people will appreciate this new service. This will allow guests to leave their phone securely in one spot while they go to an attraction or enjoy a meal without worrying about the security of their phone. And, best of all, they won’t have to sit on the ground next to their phone waiting for it to charge.